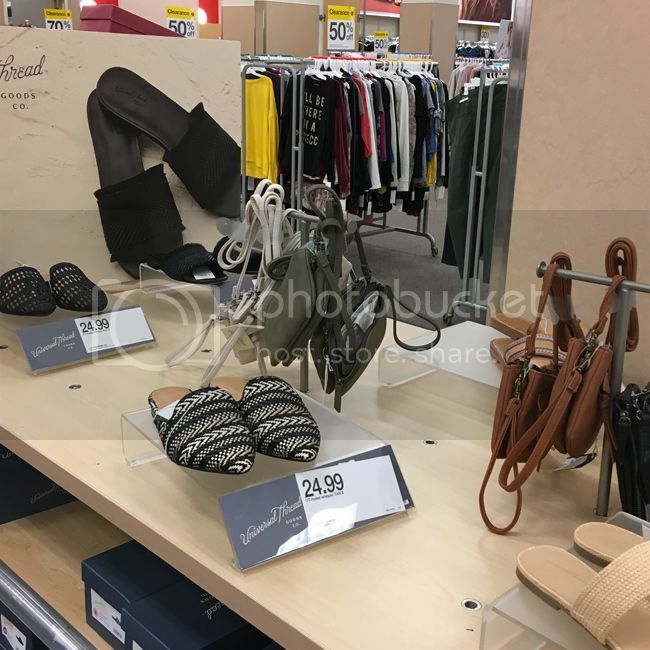 When Target launches a new brand, I'm always intrigued to see more and shop the line as soon as it hits stores. So when I spotted their denim-centric brand this month called Universal Thread, I had to get a closer look. 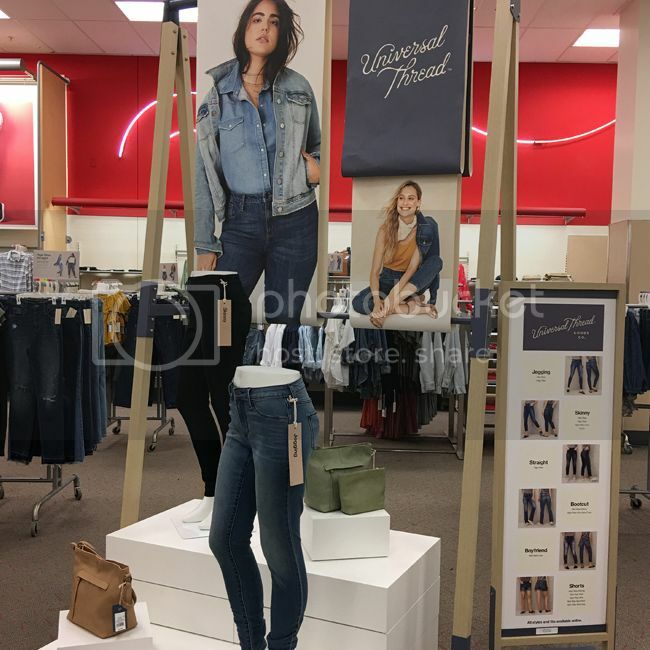 Target describes the Women's line as a "lifestyle brand that's grounded in denim." Sizes range from 00 to 26, and prices are under $39.99. Sounds good to me! 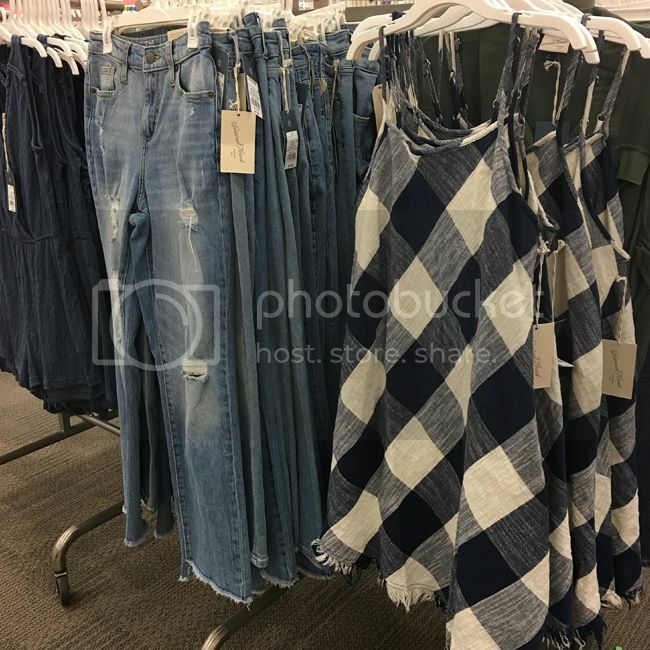 February 21, 2018 update - See five key 2018 denim trends for Women in my MAGIC trade show report on Fashion Trend Guide. Universal Thread aims to be inclusive and cater to all women, offering a variety of fits, rises, lengths, and sizes. With features such as slimming pockets, better fabric, contoured waistbands, adaptive clothing, sustainable pockets, and recycled cotton, this line sets itself apart from the competition. 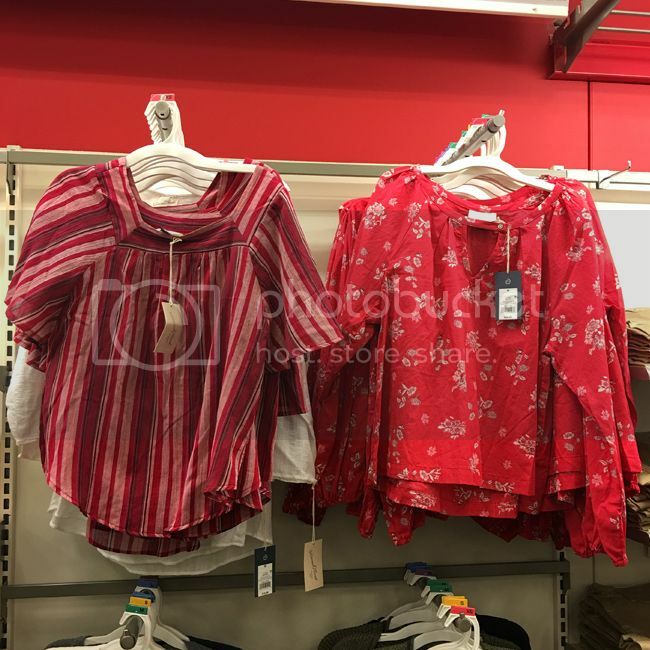 Here's a preview of what the two Target stores near me carried. Dark denim prevailed here, with skirts, woven tops, and denim dresses rounding out the mix. 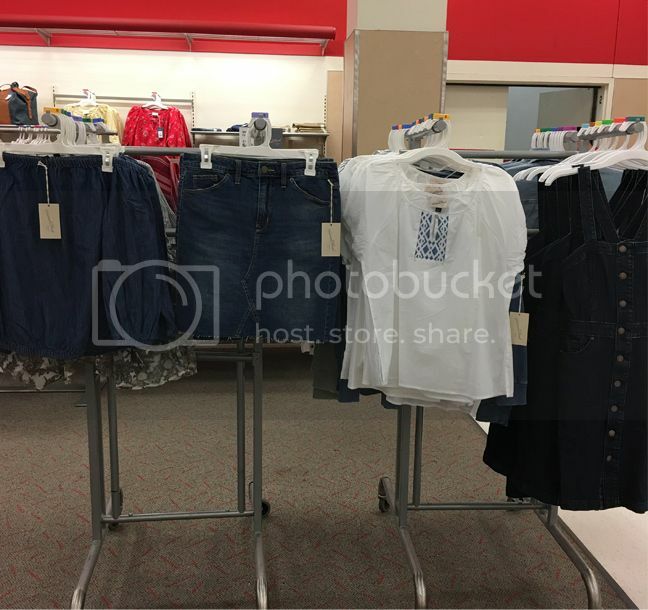 Visual merchandising felt more boutique-like, although I was not inspired to create complete looks because the tops and bottoms were scattered around. Woven blouses have an airy, boho feel. Embroidered denim, a key trend for spring/summer '18, is seen on these white skinny jeans ($27.99). Below, high rise raw hem straight jeans ($27.99) and a navy gingham dress in cotton ($24.99). I have these jeans in size 0 (they run slightly big). They keep their shape, are comfortable and fit like a girlfriend jean with a flattering high rise. The footwear has a homespun, basic feel, with lots of slides, sandals, and a few boots. I tried on my usual size 7 for reference. The Ava Shield espadrille sandals ($32.99) are my top pick. The round buckle and cognac color give them a retro feel, while the 2.5" wedge height is easy to walk in and comfortable. These run true to size and also come in black. The Aurora backless sneakers ($27.99) were much more cushioned and bouncy that they look. I like the sporty, effortless vibe. As far as sizing, they run slightly big. I'd go down half a size. The Autumn braided cut out boots ($34.99) are comfortable and run true to size if worn barefoot. If you have wide feet, I'd go half a size up. I found these to be more comfortable than expected. They were easy enough to slip on and look great with cropped denim. These also come in black. 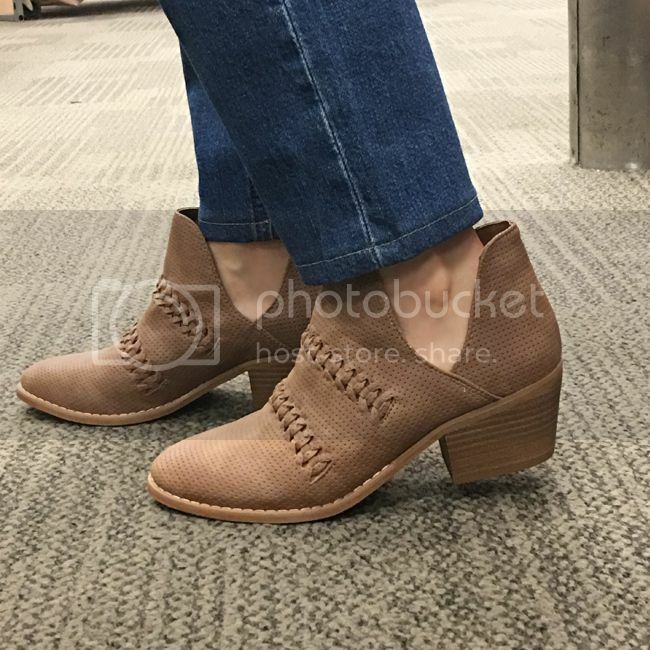 The Wenda cutout boots (A Free People dupe) are selling out quickly. They are $32.99 and also come in ivory. I tried on my usual size 7 and they felt snug as well as comfortable. If you have wide feet, I'd go up half a size. The texture has a nice faux leather feel, and the cut out detail gives some breathability. Notes on fit: it runs similar to Mossimo and Mossimo Supply Co.
Notes on quality: no loose threads, tricky openings, or stuck zippers spotted. Notes on price: the denim is a good bargain, with everything I tried on under $30. On the left is the railroad jacket ($29.99) in small with my boyfriend jeans from Zara. The jacket has an easy fit, snap front closures, and ties on the inside to cinch the waist. I liked the small striped print and laid-back vibe. What's cool about this is that it can be worn open as a jacket or closed as a layering shirt. 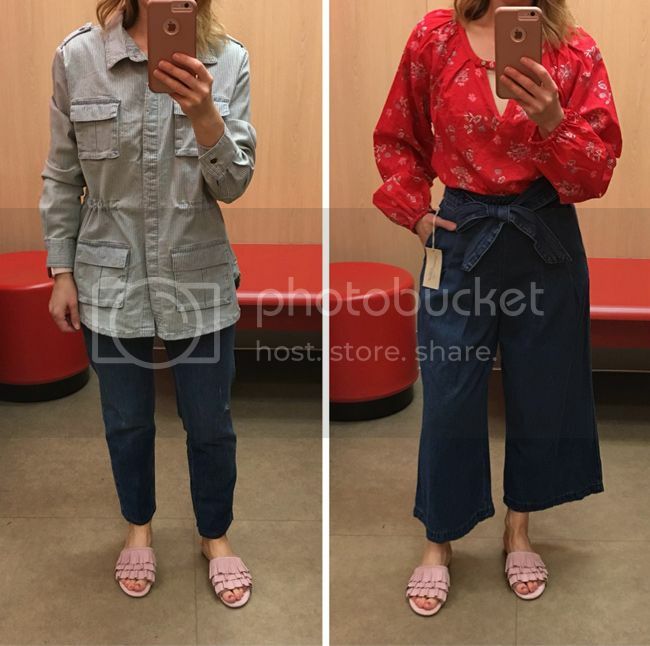 On the right is the red floral woven top in small ($24.99) with the tie-front wide leg jeans ($27.99). I loved the cotton fabric and the elastic cuffs on the blouse, and found the fit to be loose. I'd size down on this if I plan to wear it tucked in. 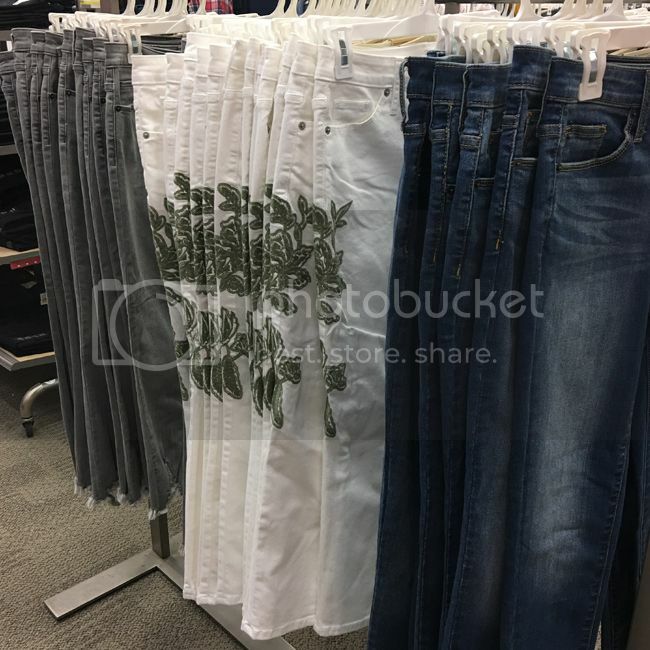 The jeans have a high rise, center back zip, and run very small in the waist. I'm wearing a size 2. They don't have back pockets so they're not that flattering on the booty. I liked the length, the side pockets, and the cute tie at the waist. Denim disclosure: I have a weakness for grey jeans. I'm ashamed to admit how many pairs I own, mostly from J Brand and Old Navy. 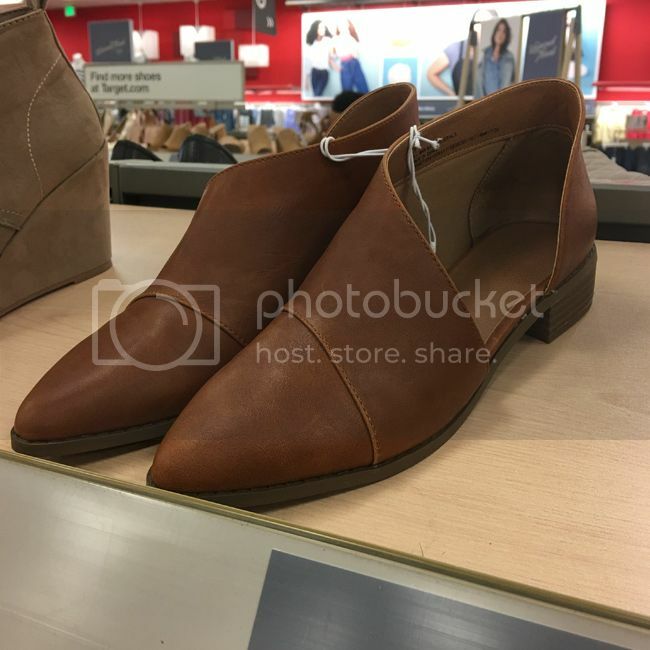 This distressed pair ($24.99) really impressed me. 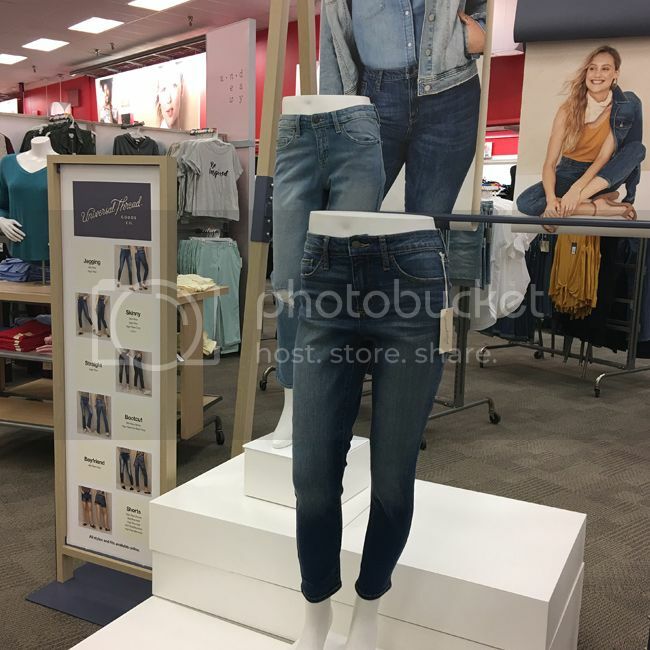 I'm wearing a size 0, and I usually get a 0 or 2 at Target. The rise is high, which I love, the pockets are not shallow in the front, and the distressed hem was a cool touch. I found them to be flattering both in front and back. I'm happy to report no gapping in the waistband! On pocket placement: sometimes the back pockets can be too small or placed to far/close together, giving an unflattering look. These were designed better than some of the Mossimo jeggings I've purchased at Target, and they met all my criteria for a great pair of skinnies. With 2% spandex, they're not too stretchy, and have enough heft to keep their shape. The 26" inseam means I don't have to hem these, so no #shortgirlproblems. I took these home without hesitation. February 15, 2018 update: I've worn the grey jeans twice now, and I love them. They don't stretch up after a few hours of wear, which is nice. I also bought the high rise skinny crop ($24.99) in a size 2 because they didn't have a size 0. After wearing them all day and walking around, they stretched up in the waist and hip area. Shoe note: I'm wearing ruffled slides by Nine West, available here in black or here in natural. I wasn't impressed by the tees, handbags, or belts, so I passed on those. My hope is that there are more woven tops, novelty jackets, embellished jeans, and on-trend blouses in the coming seasons. As far as denim, I'll be trying on some straight leg, embroidered, and high rise skinnies when I can find them in stores. As more of these Universal Thread pieces trickle into stores, I'll be sharing my favorites on social media @thekeytochic. 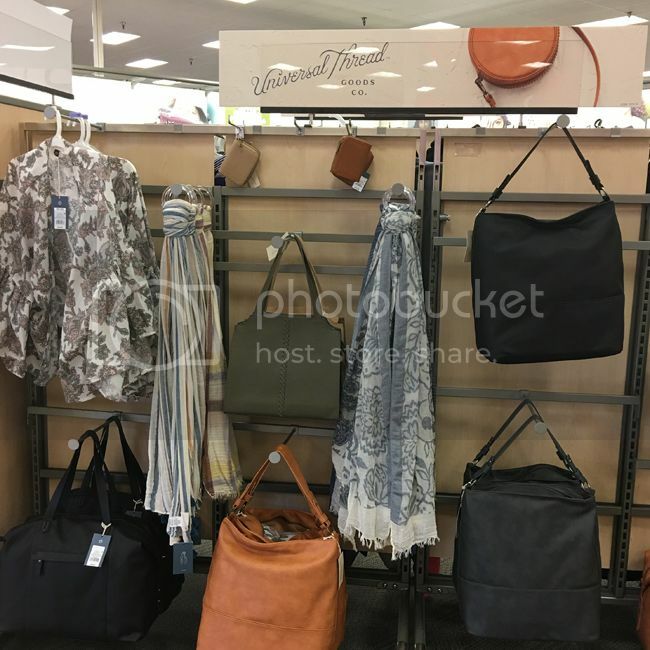 September 2018 update - Love Target style? Read my Prologue at Target review, my Wild Fable review, and my A New Day review for more style ideas and fit tips.